With the state led legalization of both adult recreational and medical cannabis, there is a need for comprehensive and reliable analytical testing to ensure consumer safety and drug potency. 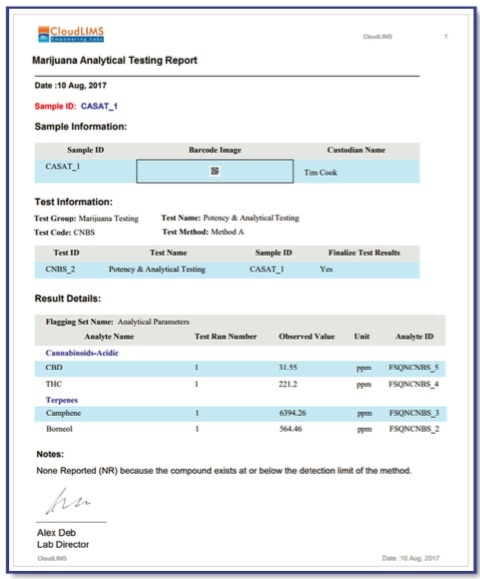 Cannabis-testing laboratories receive high volumes of test requests from cannabis cultivators for testing quantitative and qualitative aspects of the plant. The testing market is growing as more states bring in stricter enforcement policies on testing. As the number of testing labs grow, it is anticipated that the laboratories that are now servicing other markets, including high throughput contract labs, will cross into cannabis testing as regulations free up. As the volume of tests each lab performs increases, the need for laboratories to make effective use of time and resource management, such as ensuring accurate and quick results, reports, regulatory compliance, quality assurance and many other aspects of data management becomes vital in staying competitive. The samples are processed using techniques such as grinding and homogenization. This may be followed by extraction, filtration and evaporation. The processed samples are then subjected to chromatographic separation using techniques such as HPLC, UHPLC, GC and GC-MS. The separated components are then analyzed and identified for qualitative and quantitative analysis based on specialized standards and certified reference materials. The quantified analytical data will be exported from the instruments and compiled with the corresponding sample data. The test results are organized and reviewed by the lab personnel. The finalized test results are reported in a compliant format and released to the client. In order to ensure that cannabis testing laboratories function reliably, they are obliged to follow and execute certain organizational and regulatory protocols throughout the testing process. These involve critical factors that determine the accuracy of testing services of a laboratory. Accreditations & Regulatory Compliance: Cannabis testing laboratories are subject to regulatory compliance requirements, accreditation standards, laboratory practices and policies at the state level. A standard that most cannabis testing labs comply to is ISO 17025, which sets the requirements of quality standards in testing laboratories. Accreditation to this standard represents the determination of competence by an independent third party referred to as the “Accreditation Body”. Accreditation ensures that laboratories are adhering to their methods. These testing facilities have mandatory participation in proficiency tests regularly in order to maintain accreditation. Quality Assurance, Standards & Proficiency Testing: Quality assurance is in part achieved by implementing standard test methods that have been thoroughly validated. When standard methods are not available, the laboratory must validate their own methods. In addition to using valid and appropriate methods, accredited laboratories are also required to participate in appropriate and commercially available Proficiency Test Program or Inter-Laboratory Comparison Study. Both PT and ILC Programs provide laboratories with some measure of their analytic performance and compare that performance with other participating laboratories. Real-time Collaboration: Testing facilities generate metadata such as data derived from cannabis samples and infused products. The testing status and test results are best served for compliance and accessibility when integrated and stored on a centralized platform. This helps in timely data sharing and facilitates informed decision making, effective cooperation and relationships between cannabis testing facilities and growers. This platform is imperative for laboratories that have grown to high volume throughput where opportunities for errors exist. 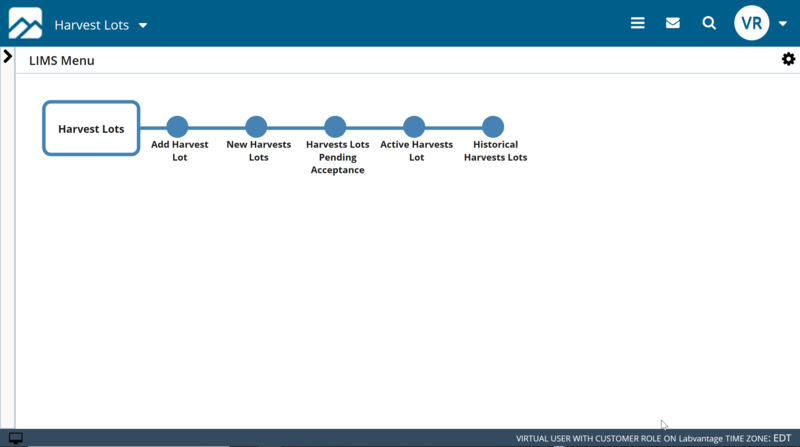 By matching test results to samples, this platform ensures consistent sample tracking and traceability. Finally, the platform is designed to provide immediate, real-time reporting to individual state or other regulatory bodies. Personnel Management: Skilled scientific staff in cannabis-testing laboratories are required to oversee testing activities. Staff should have experience in analytical chromatography instruments such as HPLC and GC-MS. 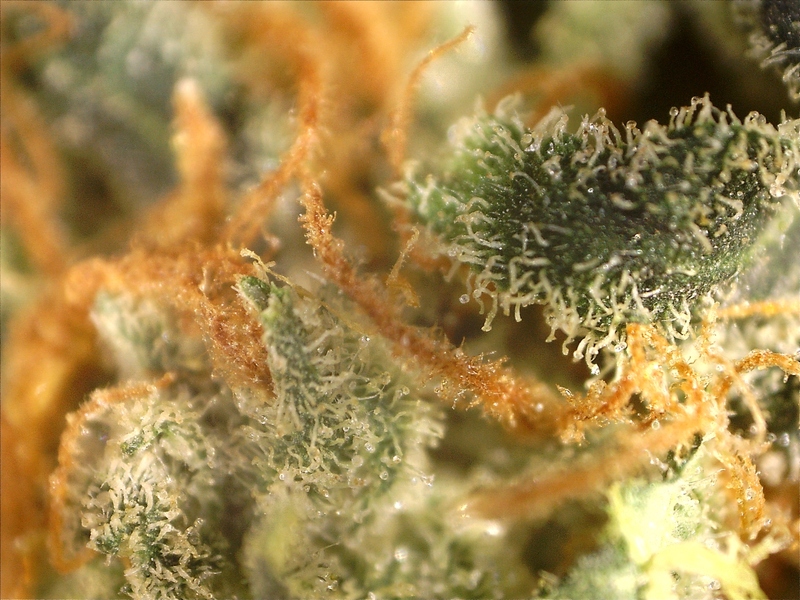 Since samples are often used for multi-analytes such as terpenes, cannabinoids, pesticides etc., the process often involves transferring samples and tests from one person to another within the testing facility. A chain of custody (CoC) is required to ensure traceability and ‘ownership’ for each person involved in the workflow. Gathering, organizing and controlling laboratory-testing data can be time-consuming, labor-intensive and challenging for cannabis testing laboratories. Using spreadsheets and paper methods for this purpose is error-prone, makes data retrieval difficult and does not allow laboratories to easily adhere to regulatory guidelines. Manual systems are cumbersome, costly and lack efficiency. 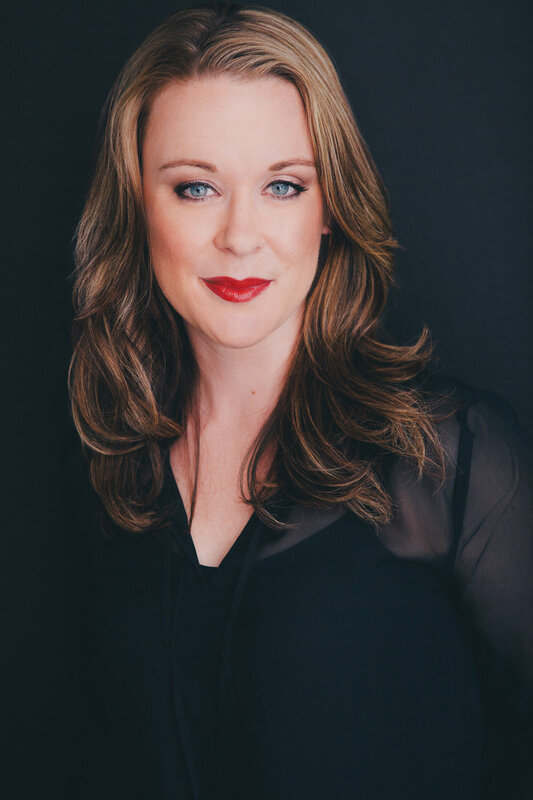 One way to meet this challenge is to switch to automated solutions that eliminate many of the mundane tasks that utilize valuable human resources.. Laboratory automation transforms the data management processes and as a result, improves the quality of services and provides faster turnaround time with significant cost savings. Automating the data management protocol will improve the quality of accountability, improve technical efficiency, and improve fiscal resources. A Laboratory Information Management System (LIMS) is a software tool for testing labs that aids efficient data management. A LIMS organizes, manages and communicates all laboratory test data and related information, such as sample and associated metadata, tests, Standard Operating Procedures (SOPs), test reports, and invoices. It also enables fully automated data exchange between instruments such as HPLCs, GC-FIDs, etc. to one consolidated location, thereby reducing transcription errors. Adheres to regulatory compliance Creates Certificates of Analysis (CoA) to prove regulatory compliance for each batch as well as batch-by-batch variance analysis and other reports as needed. Upon mapping the present day challenges faced by cannabis testing laboratories, adopting laboratory automation solutions becomes imperative. 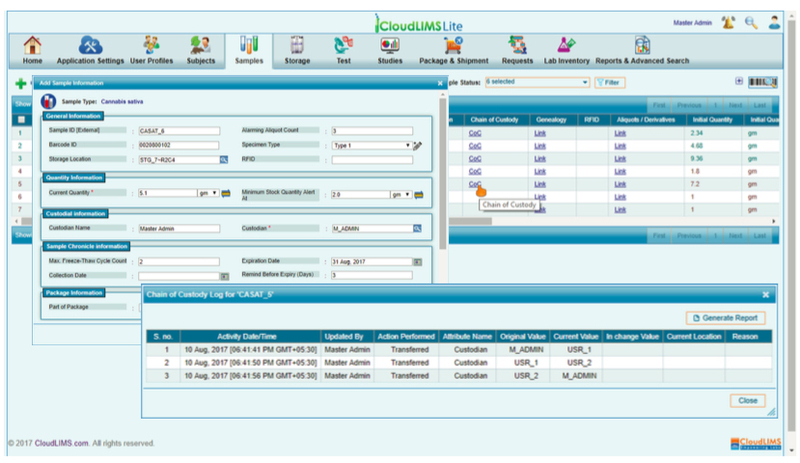 Cloud-based LIMS becomes a valuable tool for laboratory data management in cannabis testing laboratories. In addition to reducing manual workloads, and efficient resource management, it helps labs focus on productive lab operations while achieving compliance and regulatory goals with ease. For more information on this, check out a webinar here: Webinar: How to Meet Cannabis Testing Standards and Regulatory Requirements with LIMS by Stephen Goldman, laboratory director at the State of Colorado certified Cannabis testing facility, PhytaTech. Cannabis testing laboratories around the country are expanding quickly, taking on new clients and growing their business incrementally. 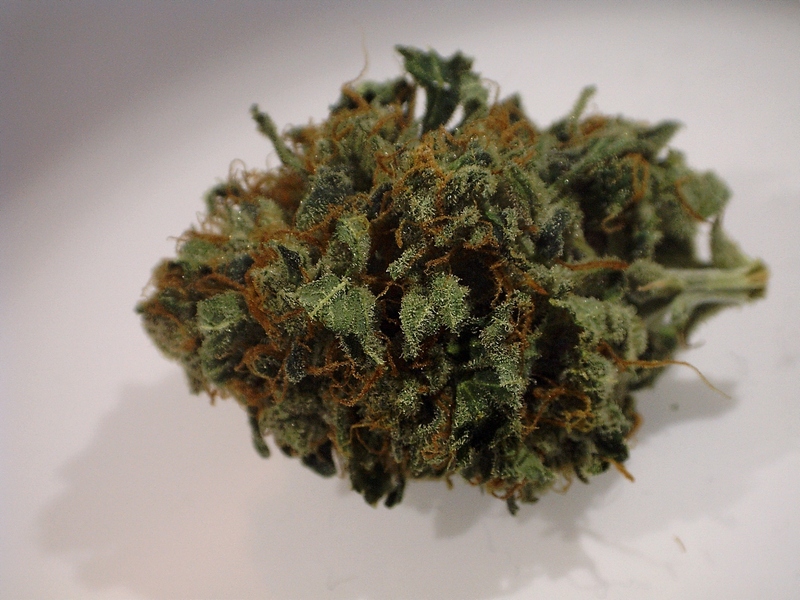 Many of these labs are receiving a large number of test requests from growers for potency testing, terpene profiling, pesticide screening, residual solvent screening, heavy metal testing, microbial analysis and even genetic testing. 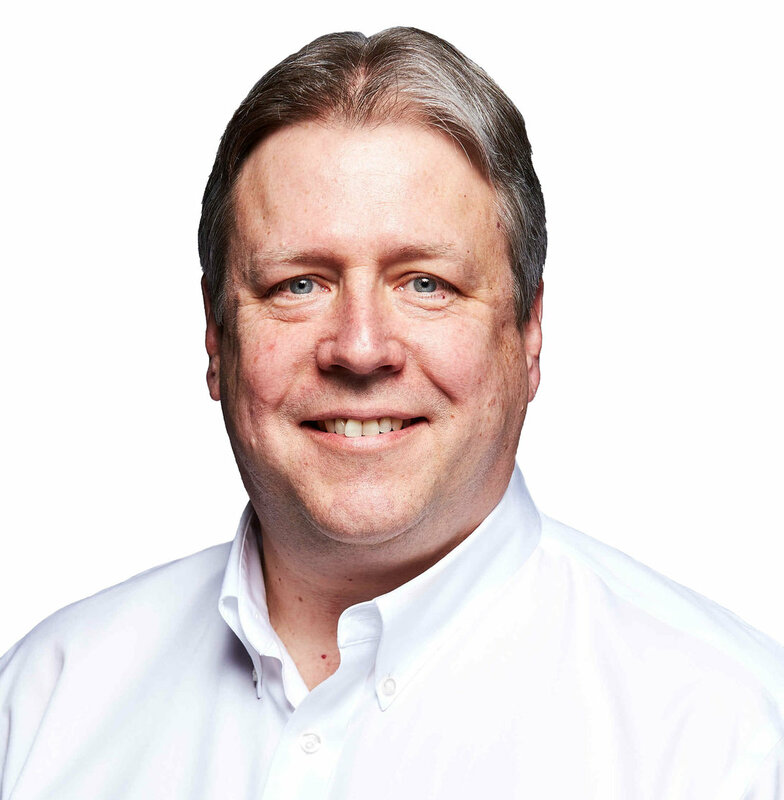 To keep pace with the number of test requests received, efficient data, sample and test management is imperative. Considering the magnitude of cannabis testing, data management using spreadsheets is a serious impediment to quality assurance. Data being recorded in spreadsheets is error-prone and difficult to manage. Furthermore, using spreadsheets does not allow labs to adhere to regulatory guidelines that demand strict accounting for every gram of the sample, right from reception, consumption for testing, to disposal. To overcome such data management challenges and improve the operational efficiency of cannabis testing laboratories, a Laboratory Information Management System (LIMS) plays a significant role. LIMS are much more capable than spreadsheets and paper-based tools for managing analytical and operational activities. LIMS enhances the productivity and quality by eliminating the manual data entry. 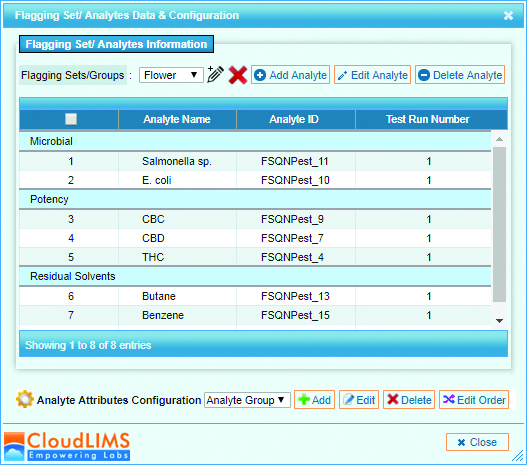 With its built-in audit trail capability, LIMS helps labs adhere to regulatory standards. LIMS can provide companies with a method to manage samples, records and test results, and ensures regulatory compliance by increasing traceability. LIMS can also be integrated with other lab instrumentation and enterprise systems, enabling easier transmission of information across the lab and the organization, reducing manual efforts and improving decision-making. Multiple resources are also available to assist labs in preparing for quality assurance and accreditation, LIMS being one of them. LIMS can help cannabis labs with instrument integration, and automate reporting to help improve efficiencies and reduce errors. 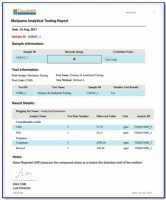 LIMS, such as CloudLIMS Lite, a cloud-based LIMS, automates cannabis-testing workflows right from sample collection, data recording, managing test chain of custody, sample weight accounting to report generation. With data security and audit trails, a LIMS provides traceable documentary evidence required to achieve ISO 17025 accreditation for highly regulated labs. Above all, cloud-enabled systems are often low in the total cost of acquisition, have maintenance outsourced, and are scalable to help meet the ever-changing business and regulatory compliance needs. Cloud-based products are secure, easy to deploy and scalable. A cloud product is typically hosted on a server with a guaranteed uptime of 99.5%, allowing for a reliable system, accessible 24×7. 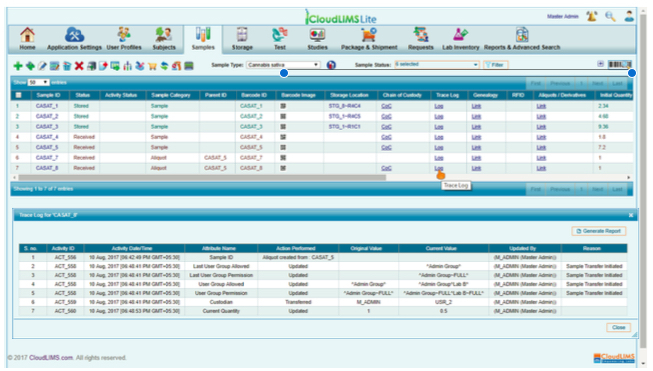 Cloud-based LIMS have automatic data backup mechanism that allow for quick turnarounds in case of a server failure or in the eventuality of a natural disaster. With LIMS in place, cannabis labs can manage sample and requisition-centric records, track sample quantity and location, integrate the test data, and provide online reports to clients. This in turn, reduces the turnaround time for testing and improves the operational efficiency. Besides, audit trail of each and every activity performed by the lab personnel is recorded in the system to ensure that the lab follows regulatory compliance. Editor’s Note: This is a condensed version of a poster that was submitted and displayed at this year’s Cannabis Science Conference in Portland, Oregon. The authors of the original poster are Arun Apte, Stephen Goldman, Aditi Gade and Shonali Paul. We have two key software platforms at our laboratory that help us stay compliant with our standard operating procedures. Saif Al-Dujaili, quality manager at Eurofins-Experchem, oversees quality assurance in our laboratory. As we like to say, you are safe with Saif. Tracking samples in our facility: When a sample is booked by our tracking system, a unique identification number is generated by the system and printed on a sticker, which is placed on the sample. 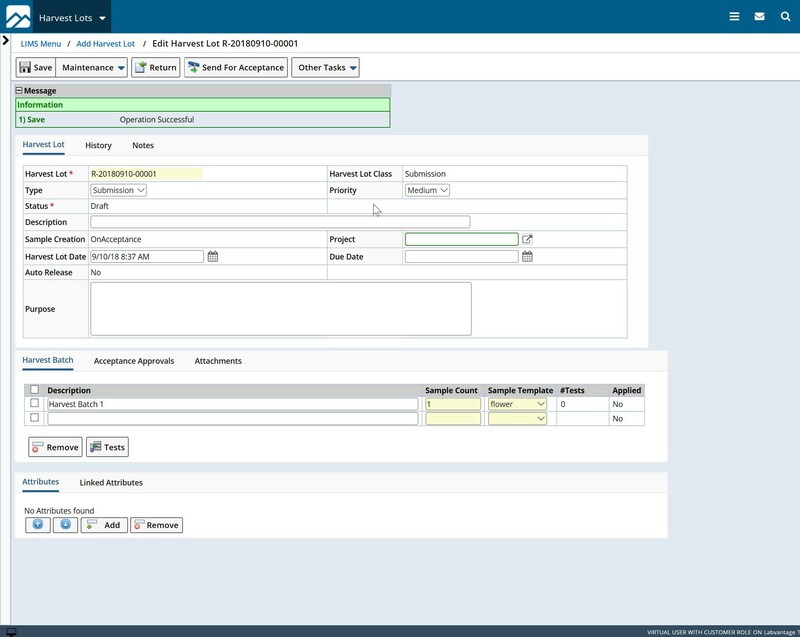 When a sample is booked, department heads then have the ability to assign work orders to the analysts through the tracking system. When testing is complete, results are entered by the analyst into the tracking system and reviewed by the quality assurance (QA) department. QA reviewers are responsible for approving results entered in the system before they are sent to the client. A certificate of analysis is then generated and e-mailed to the client for their review. Controlling stability studies conducted in our facility: Stability studies are scheduled and controlled on different samples pulled for analysis. Within our facility’s sample-tracking system we have different chamber names with different conditions where products can be placed. Which chamber we place samples in depends on protocols and requests from our client. The software used also generates a unique study number for each stability study that occurs. The stability schedule that includes each study is reviewed every week by the stability coordinator to schedule what samples need to be pulled for testing. Controlling methods used for tests: Methods are entered into the tracking system after department heads have reviewed them and it is approved by QA. The tracking system generates a unique ID number for each method as well as each sample. The method can now be tracked in our laboratory’s system. 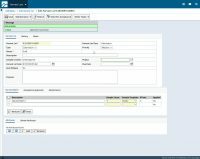 Within the software you can enter the name of the method, client name and effective date and any revisions applied to the method. Controlling inventory of columns and electrodes: Sample tracking also helps us with our purchasing patterns to make sure we have supplies for our client’s testing needs. Every time that columns and electrodes are received, they are entered into our tracking system for inventory purposes. REES is used to monitor the environmental conditions of our testing facility. Key inputs measured include temperature, humidity, differential pressure and elimination or intensity of light. REES is linked to the QA department’s computers. An audible alarm is sounded as well as e-mails sent to QA personnel to notify them if anything is out of specification. REES also phones related personnel’s cell phones to notify them of any alarms. No alarms are missed, even if they occur after working hours. Having a 24-hour environmental monitoring system in place helps Eurofins-Experchem ensure integrity in operations of stability, microbiological and other environmental conditions essential for accuracy in testing results. LIMS (laboratory information management systems) is a software-based information management tool that can streamline laboratory workflows, data management, automate repetitive steps, and improve instrumentation efficiency. The cannabis industry’s rapid growth, coupled with fluctuating state regulations, gave rise to a number of cannabis testing laboratories nationwide. Cannabis labs test primarily for potency, but testing regulations for pathogens, pesticides, and other contaminants are on their way to approval in California and Colorado. Founded in 2010, BGASoft developed LIMSABC last year. The cloud-based laboratory informatics system is a platform that can manage all of a cannabis testing laboratory’s operational needs, while providing the tracking and audit trails required by some state’s regulations. “The recreational and medical cannabis industry is in its infancy and many cannabis laboratories are small operations that need to be very capital efficient as they navigate a rapidly changing regulatory environment,” says Tim Kutz, vice president of business development at BGASoft. 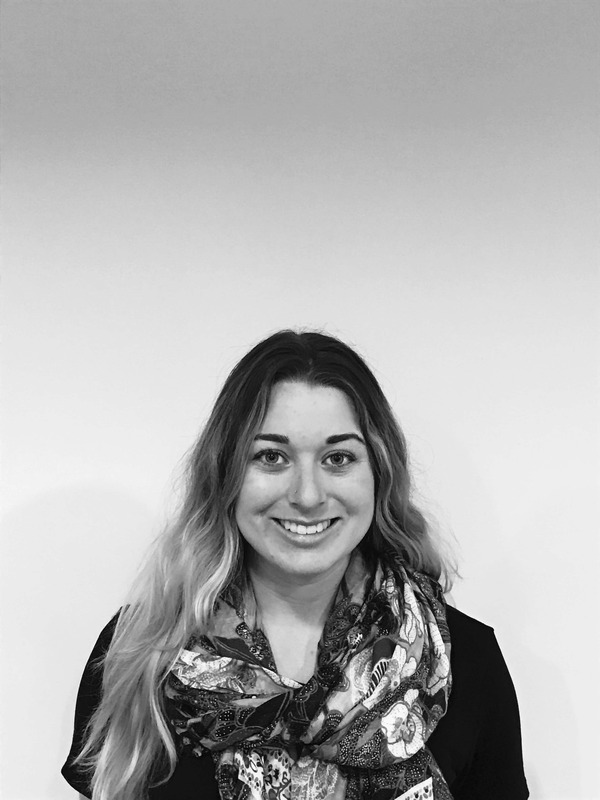 According to Kutz, LIMS can help cannabis laboratories with bi-directional instrument and automation integration, and automate client reporting to help improve efficiencies and reduce errors. Because the software is cloud-based, the system is accessible through a secure web browser connection from any device. As a result of strict sampling requirements, laboratories must account for all the sample test results from a variety of instruments as well as for every gram of the sample, from receiving it to consumption in testing to disposal. As testing regulations continue to roll out, cannabis laboratories will be required to use information management systems for traceability in compliance with state and local laws.